Please welcome Sarah Fine, author of Of Metal and Wishes, to GreenBeanTeenQueen! Sarah Fine is the author of Of Metal and Wishes. About the Book: Sixteen-year-old Wen assists her father in his medical clinic, housed in a slaughterhouse staffed by the Noor, men hired as cheap factory labor. Wen often hears the whisper of a ghost in the slaughterhouse, a ghost who grants wishes to those who need them most. And after one of the Noor humiliates Wen, the ghost grants an impulsive wish of hers—brutally. “I aimed at the public’s heart, and by accident I hit it in the stomach.” Those are the words of Upton Sinclair, author of The Jungle, the book that influenced Of Metal and Wishes. Wait, you might be thinking. Isn’t Of Metal and Wishes a retelling of The Phantom of the Opera? What the heck is this nonsense about The Jungle? Well. My book is a loose retelling of Phantom. But everything about this book—including the Ghost of the factory himself—was heavily influenced by another novel, which has haunted me from the time I first read it as a teenager. Upton Sinclair began writing The Jungle at the end of 1904 after spending nearly two months in Chicago, studying the lives and travails of immigrant workers toiling away in the heavily industrialized meat-packing industry. There, he had witnessed how the dream of having one’s hard work repaid with some financial security for one’s family was being completely turned upside-down. Instead of work = fair pay, fair treatment, and a path to success, work = danger, risk, and the inescapable trap of debt and defeat. The system was devouring these people—big business controlled everything, profit was king, and worker’s rights? Virtually nonexistent. It might be tempting to assume that we don’t have these problems in the United States anymore. In so many ways, we’ve come so far, what with unions to protect workers’ rights, and news media that can report on injustice and distribute it quickly and widely. That assumption would be wrong, however. Meatpacking is one of the more dangerous professions one can have in this country—despite improvements made in the first half of the 20th century, partly due to the response to Upton Sinclair’s work. In the last few decades, the meatpacking industry has consolidated into a few powerful entities. And they have a habit of hiring undocumented workers, who carry all the risks on their back in the hope of earning decent money for their families. These people have little legal or economic leverage, so how can they defend themselves when they’re victimized? The Jungle is unflinching in its description of the meatpacking plants, and I did my best to give OMAW the same visceral feel. I didn’t want to shy away from hitting the reader “in the stomach.” I did research into how animals are slaughtered in these places, and it is gut-wrenching and horrific. I won’t link to any videos here, but if you go to Youtube and search for video of slaughterhouse machinery, you’ll find plenty of nightmare fuel. But like Upton Sinclair, my goal wasn’t to make readers focus only on animal cruelty or the unsanitary way meat is sometimes handled before it enters the food supply. My greatest desire was to get readers thinking about those workers, the ones who come from desperate places, willing to offer their muscles and sweat in exchange for a fair wage and a chance to live and provide for the ones they love. The ones who so often get trampled and ignored. I purposely set the story outside of time and history because these issues existed over a hundred years ago, and they still exist now all over the world, including the US. 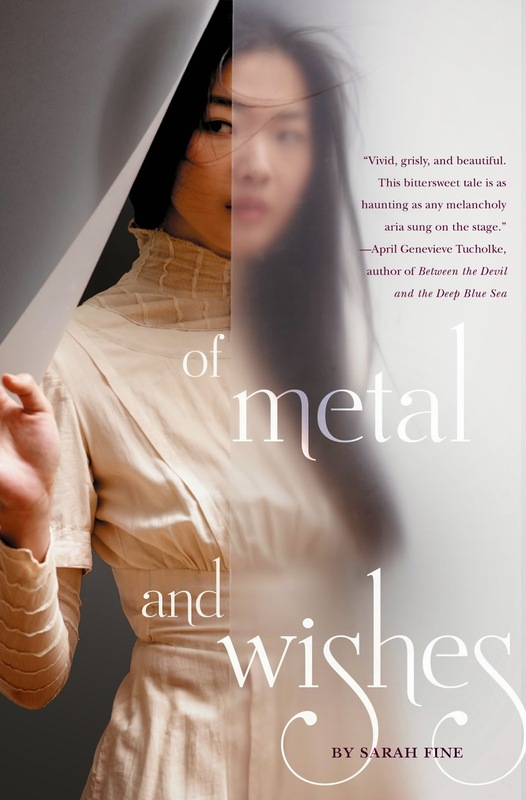 Of Metal and Wishes is a love story, yes. A sweet, poignant one, I think. But it’s also a story about people without power who struggle to survive and thrive in a system designed to crush them. I hope it hits readers in the heart. *There are many organizations involved in the fight for justice for undocumented workers, and one of my favorites is the Southern Poverty Law Center, because they also focus on a number of other important social justice issues. If you go to their site you can get more information, and if you are so inclined, contribute to their efforts.